Developing prospect profiles on your various high-quality giving candidates is a necessary step in managing a fluid transition from prospects to donors. Your prospect profiles will contain all of the relevant data you gathered during the screening process. With comprehensive profiles, your team can easily transition prospects from one person to the next, without risking miscommunication and information getting lost in the shuffle. 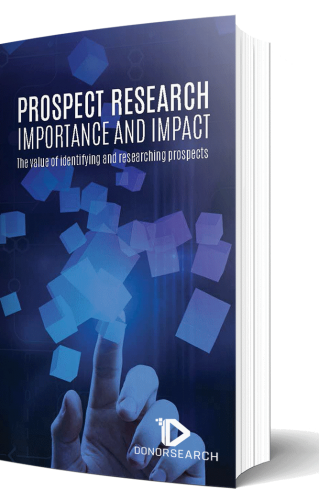 The prospect researcher is responsible for completing as much information as possible before passing on the details to a gift officer. Once the gift officer begins the donor cultivation process, he or she then tracks any additional input and changes as the relationship develops. That way, if a new officer were to step into the role, he or she would be automatically brought up to date. Prospect profiles are going to vary from organization to organization, but we wanted to give you an idea of what to expect. With that being said, this blog post will talk you through the various components you may or may not want to include in your profiles. The level of depth for your various profiles will be largely dependent on how extensive your prospect research is and what you learn during cultivation. 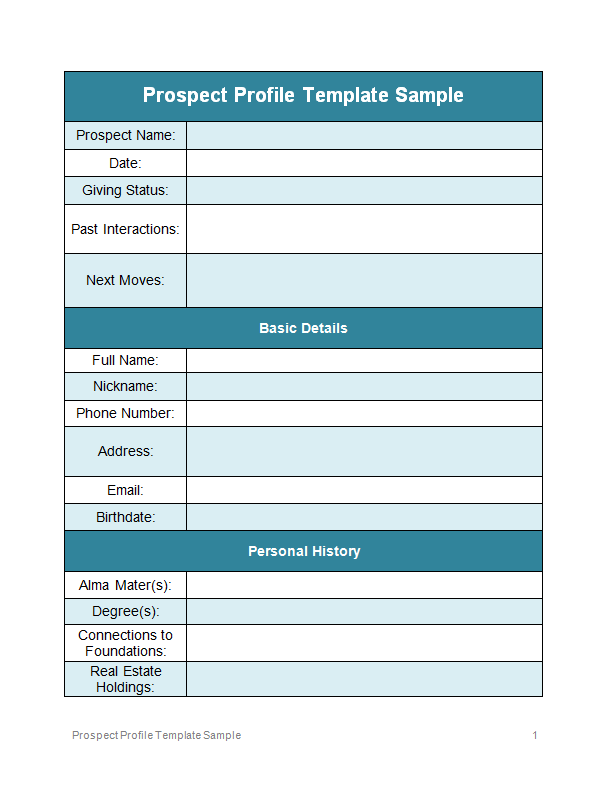 DonorSearch’s Prospect Profile Template Sample is divided into seven categories. Let’s discuss each of these one-by-one. This category is largely designed to quickly catch a reader up on the current status of the prospect. Whenever a prospect is interacted with, that should be noted here and future plans should be listed under “Next Moves.” If someone were to briefly open the profile, you want that person to be able to read through these first five sections and recognize where in the donor pipeline the given prospect falls. Basic details are essentially contact information. It is critical that your team ensures that these fields are accurate. Successful donor communications rely on current and correct contact information. The first step to building a relationship with someone is to call them by their preferred name. Nothing will get you off on the wrong foot by calling someone by the wrong name when you’re asking for a donation. It makes them feel like you don’t care about them as a person. Special note: if you’re an advocacy organization also using an advocacy-specific CRM like CQ Engage, you might also want to keep things like social media handles and voting districts in this section. These identifiers will allow you to more easily target your donors and supporters with personalized communication strategies for region- or online-specific grassroots campaigns. These details will also make it easier for you to mobilize your advocates because they can champion your cause in their own neighborhoods with your help. As important as it is to know how to reach your donors, you have to understand them on a deeper level. That understanding begins with the personal history category. As you can ascertain from looking at the above list, personal history involves a combination of wealth markers and other characteristics that will help your fundraisers better get through to your prospects. You want to know a donor’s interests and history, as well as his or her giving capacity. The personal history category helps on both fronts. As you can probably guess from the title, familial information is all about what details you have collected on your prospect’s families. Each piece of data broadens the scope of the level of personalization your organization can cover when communicating with a prospect. Your nonprofit should know a spouse’s name, so that you can address invites to the couple, rather than your donor and guest, for example. Your donors’ families are important to them. They should be important to your nonprofit too. Professional affiliations, just like familial information, can render pivotal details. With professional affiliations right in front of you, you can not only gain a firmer understanding of a prospect’s giving capacity, but also uncover potentially valuable connections. One of your board members, for instance, could work with a high-quality prospect. When you realize that, you can then ask your board member to make an introduction for you. Additionally, a donor might be employed by a company with a generous corporate giving program. Imagine the potential gift size if you notify a major gift donor that their contribution will gladly be matched by their company! Some companies also offer volunteer grant gifts, which would donate funds to your organization based on hours that an employee has spent as a volunteer for your nonprofit. As you can tell, the opportunities stemming from researching this list of facts for a donor are varied and plentiful. This is the point in the profile where you delve into exactly what motivates your prospects’ philanthropy and how strong their bonds with your specific cause and nonprofit are. For a brand new prospect, this category might be completely blank. You’ll want to revisit it as you cultivate the prospect and the prospect becomes more engaged in your organization. Past giving is the strongest indicator of future giving, so tracking these details will make a huge difference when you’re scouting for major giving candidates among your donor pool. This is where tracking becomes imperative. And finally, we have philanthropic ties. While you have the strongest chance of securing a donation from a someone who has already given to your organization, someone who has a giving history elsewhere has great potential as well. Especially if the prospect in question has donated to causes similar to yours, your nonprofit is in an excellent position to acquire that donor. Don’t be afraid to reach out to someone who is an active donor and supporter of another organization. The nonprofit sphere doesn’t operate as a zero-sum game: a lot of people are willing to support more than one organization at a time, especially when the cause or mission is near and dear to their heart. These seven categories should give your team ample research avenues to explore. There’s a wide range of databases of varying accessibility that you can use to find this information and more. How to do Prospect Research: The 3 Main Strategies by Donorly. Understanding the research process is essential for making the smartest decisions and finding the right prospects quickly. Matching Gifts: Our Definitive Guide for Nonprofits. Corporate philanthropy eligibility is an excellent way to identify highly valuable prospects whose gifts might get matched by employers. 14 Online Giving Tools to Supercharge Your Fundraising. The huge variety of online fundraising tools have made it easier than ever to engage more donors and learn more about them.